The adventure, the freedom, and the excuse to be a little naughty makes a pirate's life incredibly appealing to children and adults alike. 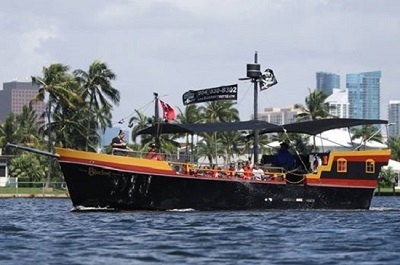 Luckily for the rest of us, the crew at Bluefoot Pirate Adventures in Fort Lauderdale, FL, is teaching their visiting crews how to be the good sort of pirates. 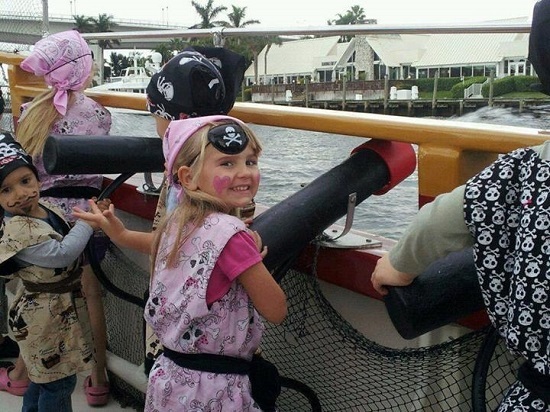 Bluefoot Pirate Adventures is an interactive adventure where kids and adults can sail along the Intercoastal Waterway and New River in search of treasure. Offering public cruises, birthday parties, and field trips to children of all ages, the crew teaches its new members how to act, dress, and talk like pirates. Guests are given bandanas, swords, fake tattoos, and painted-on mustaches, and once they’ve proven themselves, the Captain will order his crew to bring up the treasure chest as a reward. “We wake up early and dig that up so the kids don’t have to,” says Seevers. After defeating Barnacle Bill, the crew finally gets to open the chest and divvy up the loot, which consists of gold coins and gems. But, as with any good adventure, they gain so much more than treasure. Those that are on a field trip will have learned about the ecosystem, boat safety, and even future careers on the water. And even the kids that are just there to have fun leave with new knowledge. “All the kids, even those not on field trips, are learning a lot, even if they don’t feel like they’re learning,” Seevers says. Seevers explains that one of the most important things the kids learn is teamwork, and even the adults will have gained new friends by the end of the adventure. “Even on the public trips where a lot of the families don’t know each other, I find by the end families are exchanging numbers," she says. "You spend a lot of time on the ship helping each other out.” And those parents might just end up going out on a “Rated Arrrrr” Booze Cruise together on another night. Of course, every once in a while, the fantasy becomes a bit too real. Seevers recalls a moment when enthusiastic kids decided to mutiny and take over the ship. “It occasionally happens that we get a little fearless leader, but the Captain loves it and we have fun with it."